There are new dates for the OpenNebulaConf 2016, now it starts one day before, October 24-26, in Barcelona. You might be interested in taking a look at the sponsorship opportunities. Final touches are being given to the agenda, which will be published soon. The very early bird registration has been extended until 15th of June. Also, check out the list of upcoming OpenNebula TechDays to see if there is one on your doorstep that you cannot miss. OpenNebula 5.0 Wizard is around the corner! With the Beta version released recently, the team is baking a release candidate, and is planning a final stable Wizard release for mid June. Wizard is in feature freeze, and the effort is focused on solving bugs. We appreciate your feedback if you have the time to try out the Beta version! vCenter storage management, including datastore selection, disk hotplug, vmdk creation, cloning and deletion; and full integration with the new Marketplace functionality. Also, vCenter resource pool selection for deployed VMs will be possible. instantiate to persistent! Do not lose your VM changes, OpenNebula will create a new VM Template and preserver the disks of a VM, even if they are non-persistent. A great effort has been put in the new documentation. The new documentation focus on the cloud architects, admins and end users, and extra care has been taken in separating the different technologies supported by OpenNebula. Members of the community has been as helpful as always. Contributing in different ways, you are the reason why OpenNebula is such a useful project. Devuan folks have contributed a 1.0 Devuan image to the OpenNebula marketplace. 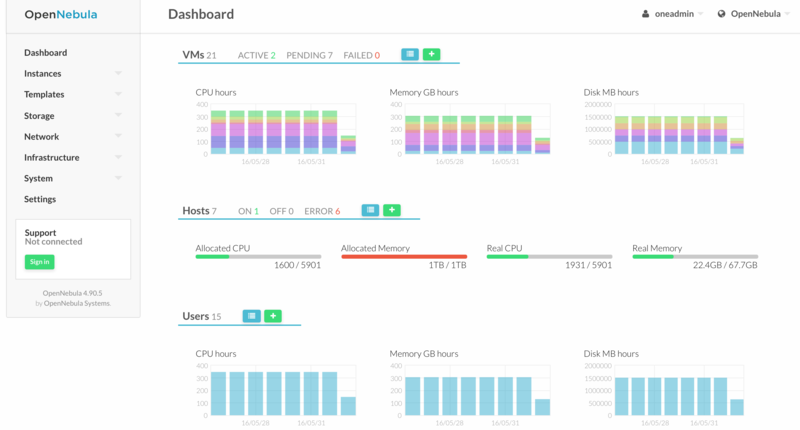 Now you can try Devuan in your OpenNebula cloud, it is just a few clicks away!. Keeping the morale high is really important, especially in hard development times such as this one (5.0 is getting this much love!). That is why getting this kind of feedback is so important, it is the fuel that keeps us going. And it is good to know that Wizard is appealing not only visually, but also feature-wise. As with translation, having material in your own language about a technology is very important to reach everyone that may be interested in it. That is why efforts like this one (in Spanish) are very, very welcome. As usual, we want to give the thumbs up to the community for their active involvement in the OpenNebula forum, specially helping newcomers. This is very important for the adoption of the project. The next OpenNebula Conference in Barcelona in October 2016 has been rescheduled to start one day before, from 24 to 26 of October. If you are willing to attend and can save now the date you can take advantage of a 40% discount in your Conf tickets until mid June. Learn about the different sponsorship opportunities in the Conference web page. Current sponsors of the OpenNebulaConf 2016 include StorPool as Platinum Sponsor, NodeWeaver as Gold Sponsor and Terradue as Silver Sponsor. If you want to understand what all the OpenNebula Conference fuzz is about, check the last Conference material (talks, slides,pictures). OpenNebula will be sponsoring this 2nd of June the OpenExpo in Madrid, an event to promote and evaluate solutions and tendencies in the FLOSS industry. OpenNebula will have a booth in which members of the project will be presenting the new features available in the upcoming release, 5.0 Wizard; as well as give two talks about the OpenNebula technology. Check out the projected OpenNebula TechDays for this year in case one is close to your location. If you are interested in participating in (or hosting) any of these TechDays agenda let us know. Besides the TechDays already celebrated (in Kuala Lumpur, Sofia, Madrid, Dallas, Toronto and Cambridge, Ede), this year members of the OpenNebula team will be participating in TechDays the following locations: Nuremberg and Dublin. The EDE OpenNebula TechDay was a total success. 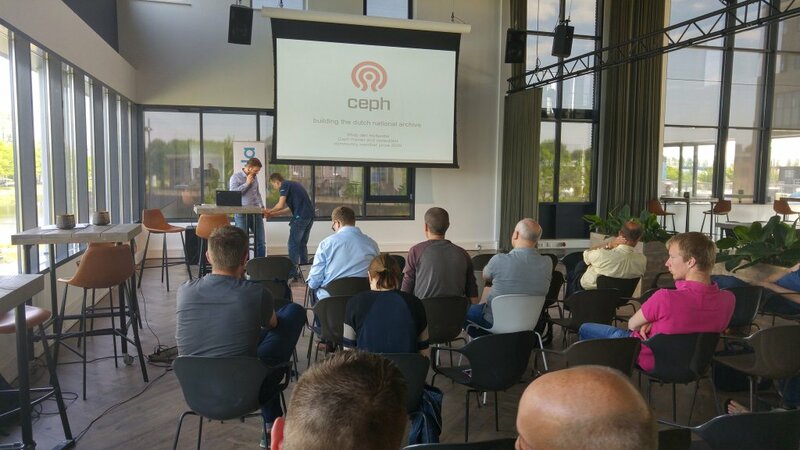 Attendees learned how people from Fujitsu and the Dutch National Archive build their infrastructure, and people from Ceph explained how their technology work.